As part of Jimmy Kimmel Live‘s “Marvel Week,” the teaser trailer for November’s Doctor Strange, starring Benedict Cumberbatch. We got a good sampling of the whole cast (which includes Rachel McAdams, Mads Mikkelson and Chiwetel Ejiofor), but one member stood out. 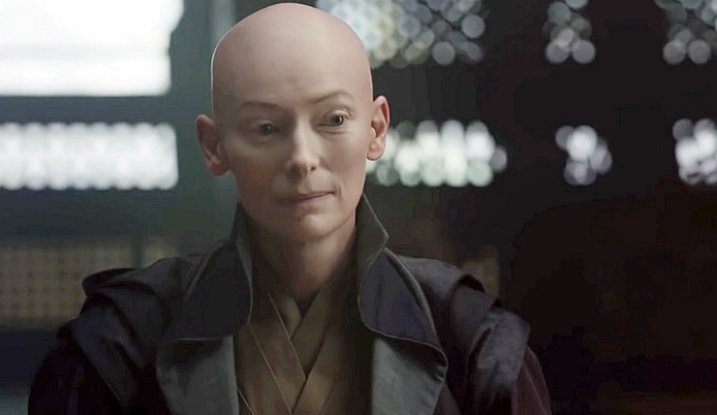 Yep that was SWINTON in all of her cue ball glory as the Ancient One knocking the Astral Plane right out of the good doctor. The teaser lays out Stephen Strange’s origin story pretty clearly. Strange is a world class surgeon who severely damages his hands (and ability to shave regularly) in a car accident. He and his unemployment beard roam the earth looking for a way to restore his hands to the point where he can perform surgery again. That’s when he learns about realms of magic and starts down the path to be Sorcerer Supreme. The trailer was packed with little nuggets like the exotic locations and Manhattan Island flipped all around, Inception style. Marvel didn’t make the same mistake as its corporate cousins at Lucasfilm. Mads Mikkelsen, missing from the Rogue One trailer, was all over Doctor Strange, bending reality to his will. Here’s another shot of SWINTON blowing Strange’s mind. Doctor Strange hits Sanctum Sanctorums all over the world in November.